Whether you'll be traveling to Grandma's house for Thanksgiving dinner or packing the family up for a late fall vacation, check out some ways to spend the holidays in Florida from where to stay to what to do. Florida is a large state, as such, there is plenty to do all over. Check out a handful of holiday happenings in the northern part of the state from the Panhandle and the Northeast coast to the Orlando area in Central Florida and the Southeast. The Fairbanks House Bed and Breakfast on Amelia Island on the Atlantic coast just north of Jacksonville offers three- and four-night Thanksgiving holiday packages that include a daily gourmet breakfast, bedtime sweets, and more. This historic district location puts you smack dab in the middle of town, which is a perfect spot to kick off the holiday shopping season on Centre Street. 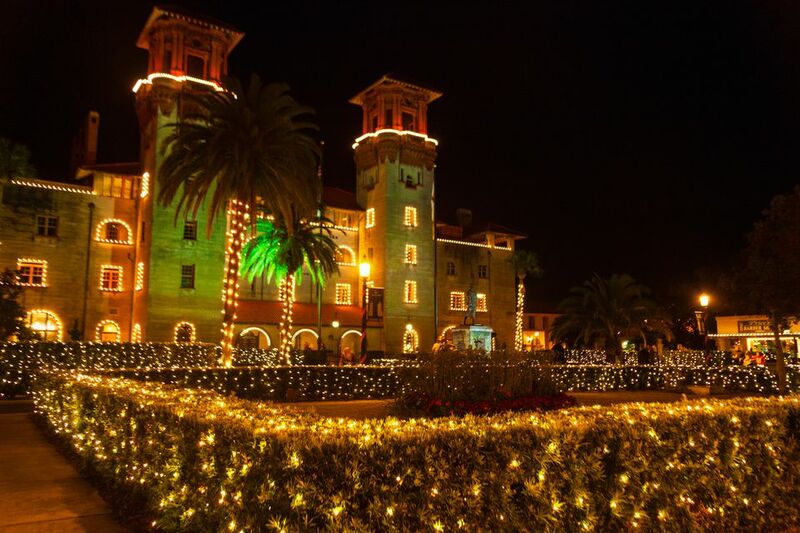 St. Augustine, the nation's oldest city, decorates the historic district with millions of lights in the Nights of Lights grand celebration that kicks off just before Thanksgiving and runs through the end of January. During Nights of Lights, businesses downtown stay open later, letting you dine in view of the lights and shop amongst the lit buildings. The trains and trolleys offer special seasonal tours that take you through the best areas of Nights of Lights, and there are also a variety of specialty tours—everything from walking to horse-and-carriage tours, and even tours to see the lights from the water and from the air. Pensacola's Winterfest preview tour kicks off just before Thanksgiving. The downtown tours feature interactive displays of holiday scenes and characters, including 16 performances during a 60-minute trolley trip through downtown Pensacola. Singing guides accompany you into a world of wonder with scenes from your favorite holiday memories. The towering Gaylord Palms Resort near Orlando offers a special package that includes one, two, or three nights of accommodations, tickets to ICE!, and one ICE! photo. The Gaylord Palms' restaurant Villa de Flora has a Thanksgiving buffet. And, the Old Hickory Steakhouse hosts a Thanksgiving dinner. For both, call ahead for reservations. Disney World celebrates the holidays with special displays and millions of sparkling lights that brighten the theme parks and on-property resorts around Thanksgiving. Mickey's Very Merry Christmas Party is held at the Magic Kingdom during select nights in November and December. The special-ticketed event is great fun for the entire family and features a special parade and sweet treats. If you are staying at a Disney World Resort over Thanksgiving, you can find a ​traditional Thanksgiving dinner at your resort or see a parade and grab a turkey leg on the go in the theme parks. For families wanting a more laidback Thanksgiving weekend head to Orlando's Villas of Grand Cypress for their Thanksgiving weekend celebration. The weekend includes a complimentary Thanksgiving brunch, and ample family-friendly activities like a game of foot-golf (played on the resort's 45-hole golf course), fishing in the resort's lake, and bike rentals. Plus, the Villas of Grand Cypress is a Disney World Gateway Hotel which means guests can buy park tickets and book FastPass+ selections through the resort's website. Complimentary transportation to Disney is also available. The package starts at $319 a night. The free annual downtown Delray Beach Thanksgiving Weekend Art Festival usually draws hundreds of artists that exhibit their unique creations. This annual juried art festival of hand-crafted artwork including glass, photography, painting, mixed media, fiber, jewelry, and much more. Skip Black Friday and browse original arts and fine crafts. You are sure to find something unique for most everyone on your holiday gift list. Vero Beach's Costa d'Este Beach Resort & Spa offers a relaxing holiday weekend like no other. Enjoy a Thanksgiving brunch, sunrise beach yoga, spa treatments, and beachside cabanas. The package starts at $445 a night, but if you're looking for a romantic and rallying getaway, Costa d'Este won't disappoint. It's owned by Gloria and Emilio Estefan, after all.